Tuesday July 12 1910 The forenoon was put in with the regular work. Vera wrote a letter and I wrote both Cora & Fannie Will did not feel well so Vera went down home alone for the afternoon. 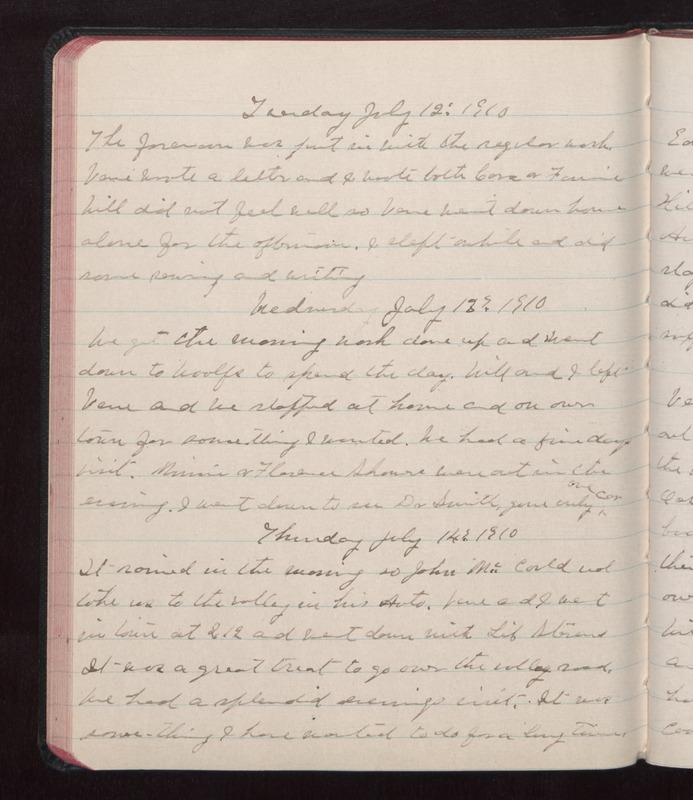 I slept awhile and did some sewing and writing Wednesday July 13 1910 We got the morning work done and went down to Woolfs to spend the day. Will and I left Vera and we stopped at home and on over town for something I wanted. We had a fine days visit. Minnie & Florence [Showers?] were out in the evening. I went down to see Dr Smith, gone only one car Thursday July 14 1910 It rained in the morning so John Mc could not take us to the valley in his Auto. Vera and & went in town at 2.12 and went down with [Lif?] Stevens It was a great treat to go over the valley road. We had a splendid evenings visit. It was some-thing I have wanted to do for a long time.